But what about kids who seem to have a wireless device in-hand at all times? A recent scientific statement from the American Heart Association (AHA) says parents should be concerned if kids are absorbed with handheld screens day and night because it’s leading to increased sedentary behavior. According to the AHA’s statement, kids between the ages of 8 and 18 spend an average of 7 hours a day using a screen, including computers, smart phones and other mobile devices. That much screen time can contribute to health problems in kids, and is a concern shared by pediatrician Kimberly Brown, MD, with the Children’s Clinic at Lehigh Valley Hospital–17th Street. “In the last 5-10 years, screen time has gone way up – particularly in the form of phone and tablet usage,” Brown says. If unlimited use of screen devices among kids is putting them at risk for current or future health problems, what is the answer? “Parents can do a number of things including setting and enforcing limits to screen time, watching TV or internet-streamed shows with their children in order to monitor and interpret content,” Brown says. She also recommends not putting a television in a child's bedroom, and encourages parents to take away electronics at bedtime. Teens – “Recognizing that most teens are going to be engaged with TV or their mobile device for more than 2 hours a day, I suggest for them that sports/outdoor play time should be encouraged after school and that school work should be completed prior to allowing screen time,” Brown says. A fun and non-penalizing antidote to screen time is activity. “Young children should be playing – outdoors as well as indoors where they can read, play games, put together puzzles, create artwork, or have fun with imaginative play,” Brown says. “Older children should be engaged in outdoor play, such as organized sports or more casual play with friends, plus spending time reading, and participating in hobbies like art, music, cooking or building,” she says. Coupled with parents who limit their own screen time, families can spend quality time interacting and having fun without a screen slowing them down. Our pediatricians, family medicine physicians, nurse practitioners and physician assistants love kids. 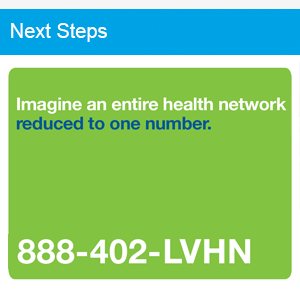 Find a great health care provider for your child at LVHN.org/Find_a_doctor or Schedule Now on LVHN.org.